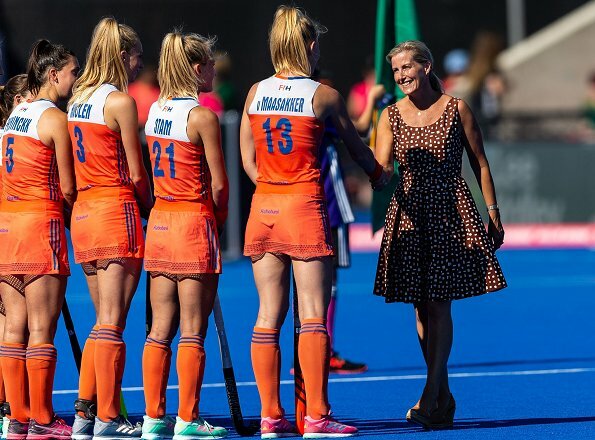 On August 5, 2018, Sophie, Countess of Wessex and her daughter, Lady Louise Windsor, attended the final of the 2018 Hockey Women’s World Cup at the Lee Valley Hockey and Tennis Centre in London. 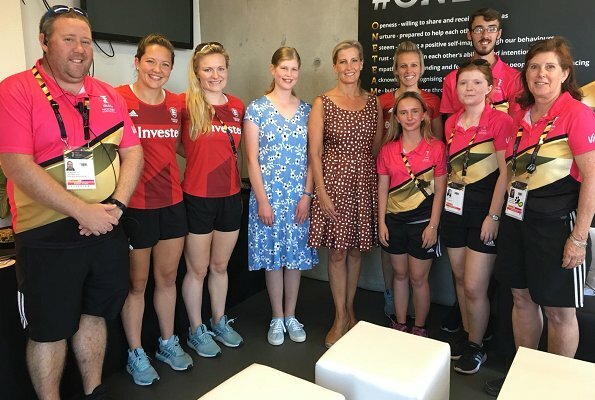 The Countess of Wessex and Lady Louise Windsor met with some of the England Hockey players at the event, as well as the and volunteer “Hockey Makers” who play a crucial role in the smooth running of the tournament. The Countess of Wessex is the Patron of England Hockey since 2006. Like both their dresses. Nice to see Louise . 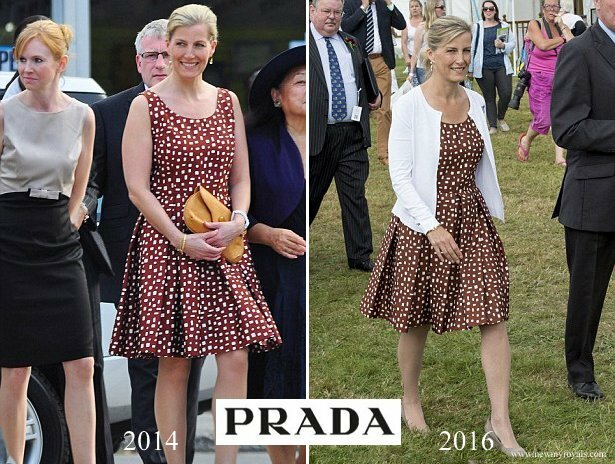 Too bad the Duchess doesn’t appear to help lovely Lady Louise select a wardrobe that is age appropriate. That dress looks like something a tired woman would wear around a retirement home. My Mom is 84 and she wouldn’t be caught dressed in such a frumpy house dress. I totally disagree. Louise is a teenager and I am glad that she is not one of these narcissistic, self-absorbed, entitled young aristocrats. She will develop her own style eventually. In the meantime she is developing her own interests and passions. Cette tenue est vieillotte. C'est une adolescente elle peut mettre de jolies robes estivales. Cette robe la rend vieille. Sa mère est en accord avec son âge tout en étant classe. Totally agree. I am 82 and wouldn't wear that monstrosity. But which Duchess are you referring to? Sophie is a countess. Thanks my mistake! One can pursue passions without looking like you are wearing a granny pajama, house dress. I thought that Louise had her mother's dress on. Perhaps it did belong to Sophie way back when she was heavier. I'm 67 and wouldn't be caught in Louise's dress and my 88 year old mother wouldn't have anything to do with it either. I don't know of any young lady who doesn't want to wear something pretty unless she's a tomboy. Being narcissistic, self-absorbed, or entitled doesn't figure into it. actually they should have swapped dresses. Yes, although Louise's dress wouldn't have looked good on Sophie either. I like Sophie's dress here. I find it hard to imagine Louise could have picked something so old-looking for herself. Lady Louise is really growing into a beautiful young lady. I think she didn't find her style yet and maybe she's not so into fashion, but that's ok, she's a teenager, she has time to find her style. Agree. I think British teenagers may have some problems with clothes, they are wearing school uniforms. I remember how difficult it was to find nice clothes to daughters about 10 - 15 years. They have such a nice young children clothes but that age was somehow missing. Louisa will learn to dress, there is plenty of time. I am happy she is now and then visible. I'm also happy to see her in several occasions. And I wanted to say: the dress is not that bad, it would just need a little bit more shape. maybe a belt would fit very nice. Nice to see them.both out. Sophie looks great - lovely and summery. Louise, like most teenagers probably doesn't always listen to mum anyway. I think the material is pretty but maybe slightly shorter and more fitted (like Sophie's dress) might have been a bit more flattering - that being said she looks fine to me. They both look very dowdy and poor Louise looks awful.Soph.is a very plain woman, nice but not really into fashion. I thoroughly disagree. Sophie is not a very plain woman and given the designer labels she wears she is clearly interested in what she wears - you may not like her style but that is a different matter. that are very rough, rude and unfriendly words especially about Louise who, in the end, is still a child. Louise is into horses and carriage driving, so she has balance w/her hobbies and it doesn't appear she will be getting obsessed w/fashion. She is 14 and there are plenty of teenagers who prefer loose fitting clothes. The print is season appropriate, pretty blue background with short sleeves. Sophie's dress has an interesting print, classic bodice detail and this season's 'in' pleating. No wonder Prada is successful. 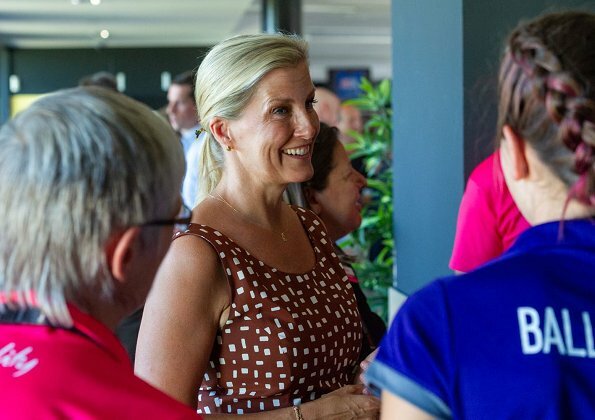 Louise changed her hair part; she resembles both her mother and her Greek and Danish Royal relatives. Nice pedigree. Louise´s dress needs a belt - that would both define her waist and give the dress some structure. If the bodice is then pulled up a bit (and not tugged tightly into the belt) it might even make the skirt hem end up a bit higher which would be more flattering. Lady Louise dresses as she wishes. Just like any teenager. It is not a monstrosity, common. Beautiful dress , color and print. She is not into fashion but she surely is a great person with a beautiful personality. Bien voyons donc Lady Louise! Cette tenue est absolument affreuse pour une jeune fille de son âge. Sophie looks better here than she has in a while. Finally a dress that isn't too long, and she is wearing the perfect shoes with it. She has been aging herself with her long dresses, and she looks more youthful here. Louise has tried with her shoes (perfect!) but the dress looks too big and shapeless. I don't think it is terrible, but I do think it could have used a nip and tuck. It is wonderful that she is able to step out with her mom now. With that will come criticisms. I hope she is prepared. Lady Louise can choose age-appropriate clothing, with her mom’s guidance. Other EU royal kids in her age group, dress/are dressed more age-appropriately.